We set out to answer these and related questions in our latest episode of Life Kit's podcast Parenting: Difficult Conversations, with help from Sesame Workshop. Disney characters, she points out, used to be more diverse: There was Cinderella, sure, but also Pinocchio and Bambi. When 1989's The Little Mermaid made a splash, Hains says, "Disney realized profitability in girls." Enter the juggernaut Disney Princess brand. Plus, marketers now cloak even gender-neutral toys like blocks in both primary and pastel shades in the hope of selling more sets. 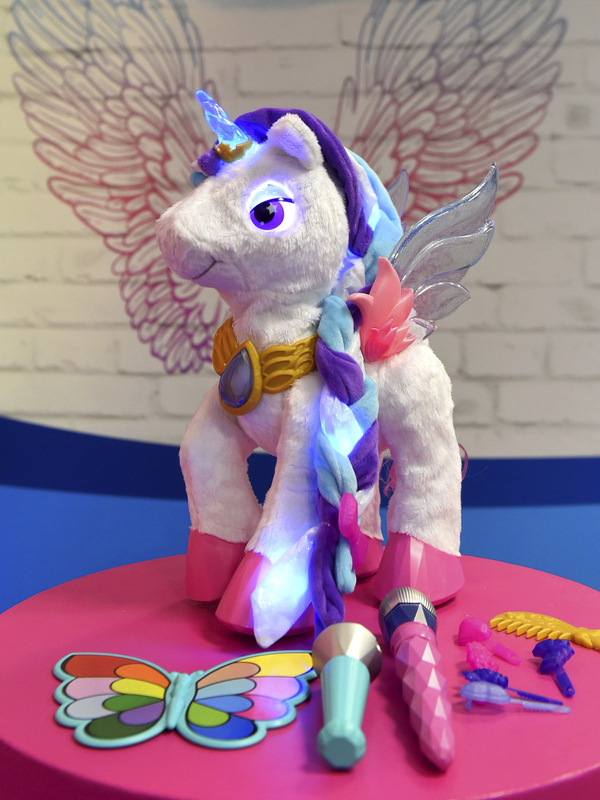 A unicorn and her accessories at the North American International Toy Fair in New York in February. Even with several women vying to be the United States' next president, and even with a greater awareness of the spectrum of gender identity than we've ever had in our culture, Hains says, "it's almost like kids are subject to stereotypes that we've evolved out of elsewhere." In a 2013 study of undergraduate women, one-third identified themselves as "princesses." They placed a higher value on the physical attractiveness of a mate, were less likely to want to join the workforce after college and were more likely to say they wanted to marry a breadwinner. And when all the women were given puzzles to solve, the "princesses" quit faster. Researchers haven't proved that all little girls who like tutus will grow up to be entitled quitters. But play does prepare children for life, so boys and girls both need broad options, says Rosemarie Truglio, a developmental psychologist and vice president of education and research for Sesame Workshop. "It's OK for me to like pink things and pretty things and frilly things, but it shouldn't define who I am and shouldn't define what I will be in the future," Truglio says. "Anyone who is singly defined doesn't make a really interesting person." 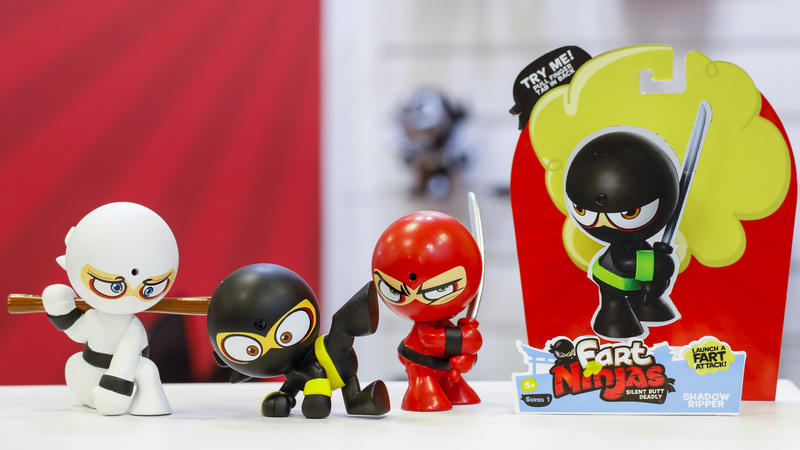 Fart Ninjas wore their primary colors to the toy fair in New York. "I don't think banning anything is the answer," Truglio says. She found this out the hard way as a mom herself. At first "we had the rule: No [toy] guns in our home," she says. But she realized that all her young son's friends were playing with them, typically in the hallway of their apartment building. No toy is inherently good or wicked, says Lisa Dinella, a gender studies professor at Monmouth University and co-author of the aforementioned 2013 princess study. With a gun, "you can be really, really aggressive, or you can just be shooting targets." Equally, a princess game could be all about being pretty, or it could have a sophisticated plot. One red flag, Truglio says, is when there's no variety to a child's play. For example, if your child wants to play with only toy guns, and the play is always aggressive, then that could be a sign for you, as a parent, to step in and find out what's really troubling the child. Dinella says kids start learning gender stereotypes before they're out of diapers. "Between 18 months and 2 years is the first time we're starting to see their awareness." "So it's really hard to separate out toy preference from gender socialization that is so insidious," Hains says. 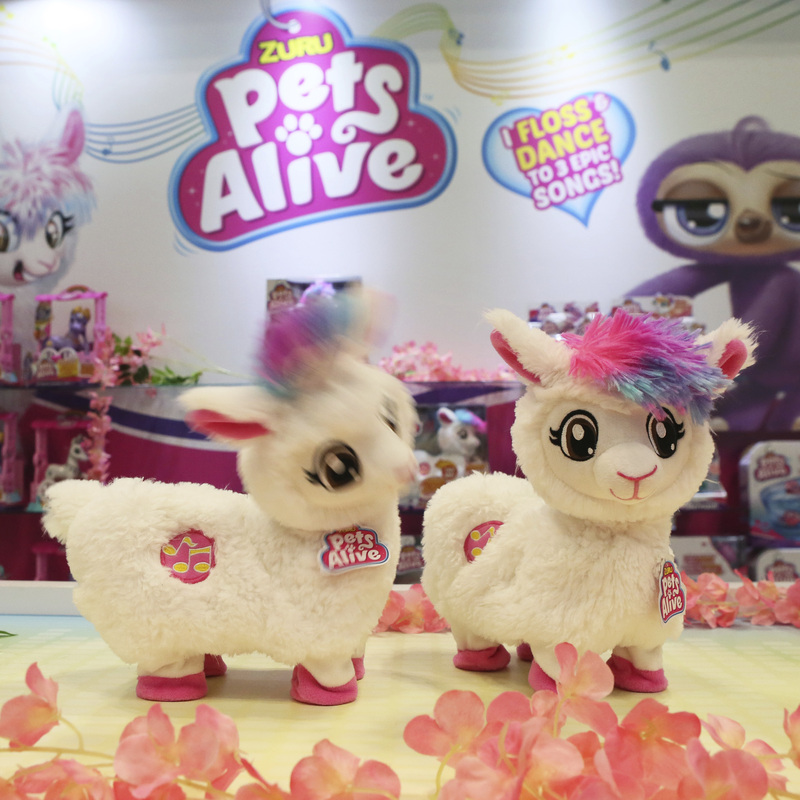 Boppi the Booty Shakin' Llama, from Zuru's Pets Alive line, combines llamas and butts, two top trends at the North American International Toy Fair. Dinella has done several experiments on how heavy gender branding influences kids' toy choices. In one, she and her team painted a bunch of toys white. Without color cues, both boys and girls gravitated toward neutral playthings like Play-Doh and the Etch A Sketch. 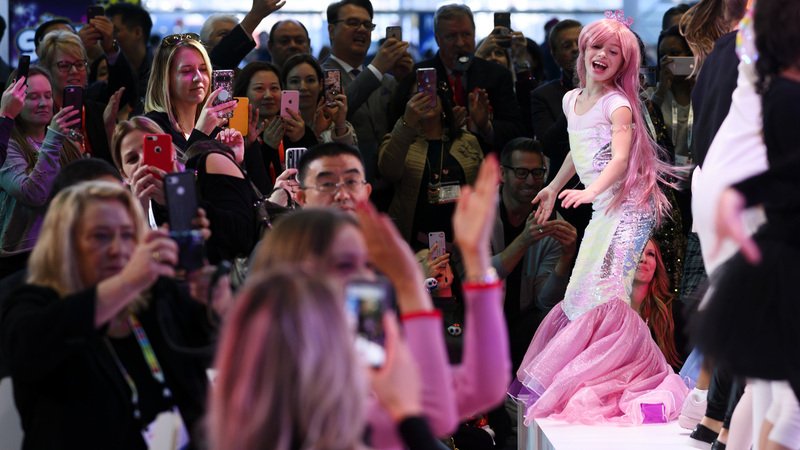 In another experiment, titled "Pink Gives Girls Permission," Dinella and her co-authors flipped the traditional color patterns: pink trucks and camouflage-clad baby dolls. 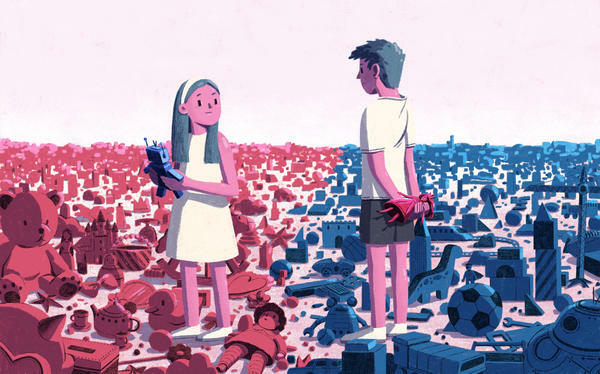 She found that "there's a bigger barrier to boys playing with girl things and acting like girls than for girls to be able to venture into some of these cross-gender plays." This is too bad, she says, because toys can teach important and sometimes unexpected skills. Dolls prepare boys for future roles as fathers and help them practice empathy. Acting out a tea party can help children learn "cognitive sequencing of events: the beginning, the middle and the end of a task." In other words, a tea set can introduce one of the foundations of computer coding. So Dinella suggests that, when toy shopping, strive for gender balanced as well as gender neutral. Try saying something like, "You have four dolls already, so how about ... also getting a truck?" Or, "Can we get it in the white version so that all of the kids, when they come to our house, can play with it, instead of just the pink version?" A girl dressed as a mermaid worked the runway at a fashion show at the toy show. Dinella is also a mother, and she didn't ban toy guns either. But she does let her children know that she's not wild about them. "I'm never going to say, 'Hey, we haven't played with the Nerf guns a lot lately! Let's get those out!' "
In other cases, she says, you can be more direct. "You can say, 'This dress-up toy that was given to you, although it's really sparkly ... it does really talk to you about being pretty. And I would rather you spend time trying to get smart." 5: Join in your child's play to further expand the possibilities. If a foam-dart shootout is getting out of hand, ordering the combatants to timeout isn't all that effective, says Truglio. Instead, "maybe you take on a character role ... who is going to stop this type of aggression." Another of Dinella's studies suggests that they are having an impact. She asked preschoolers — both boys and girls — to describe themselves and also to describe what they knew about princesses. Not surprisingly, they described princesses as the typical girly girl who needs to be rescued. Watching those images changed the children's perceptions of princesses, and, Dinella says, it changed kids' own self-descriptions too. After seeing princesses being powerful, both the girls and the boys described themselves as more multidimensional: "They [would] say: 'I am strong. I am powerful. I am a leader.' But also, 'I am caring, and I share.' "
Truglio sums it up this way. "Kids play what they see. If you can see it, you can play it — then one day you can be it." For the next few minutes, we're going to talk about toys - not just for kids. We're going to explore whether what we play with as kids and how we play with those toys actually shapes who we become as adults. NPR's new parenting podcast, Life Kit For Parents With Sesame Workshop, has taken a deep dive into the toy bin. It is hosted by NPR education reporters Cory Turner and Anya Kamenetz, and they join me now. ANYA KAMENETZ, BYLINE: Hi, Rachel. MARTIN: Toys - we're talking about toys. TURNER: (Laughter) We're going to talk about toys. MARTIN: Talk about toys. I don't know. I've got a lot of opinions about the toys that my kids play with (laughter). MARTIN: ...Hoping you're going to give me some answers here. TURNER: ...Were scratching our heads. KAMENETZ: So Cory was like, let's do an episode about toy guns. KAMENETZ: And was like, wait a second. I've got two girls. There's no guns in my house. KAMENETZ: That's not even an issue. But I have a daughter who just started to dress herself. And all she wants to do is wear five tutus at the same time. MARTIN: I mean, that's not necessarily a horrible thing. Right? Some girls really like princesses. And there are things that are magical and endearing about princess culture. KAMENETZ: Well, that's exactly right. So that was exactly the journey we went on because it was like - well, are we - is it just our personal taste? You know, where do we actually draw the line? And that's why we went to the toy fair in New York. MARTIN: The toy fair in New York - OK.
TURNER: One of the biggest toy fairs in the world. TURNER: Oh, it was pretty awesome. Here - let's take a listen, and you will hear the awesomeness. KAMENETZ: That is the Barbie gallery. UNIDENTIFIED TOY COMPANY REPRESENTATIVE #1: We have our official 60th Anniversary Barbie. UNIDENTIFIED TOY COMPANY REPRESENTATIVE #2: It's got a rotating barrel, and it's full auto. So kids just load up the belt, power on and shoot away. MARTIN: So what'd you learn here? KAMENETZ: Toys, in some ways, have not changed in terms of how gendered they are. 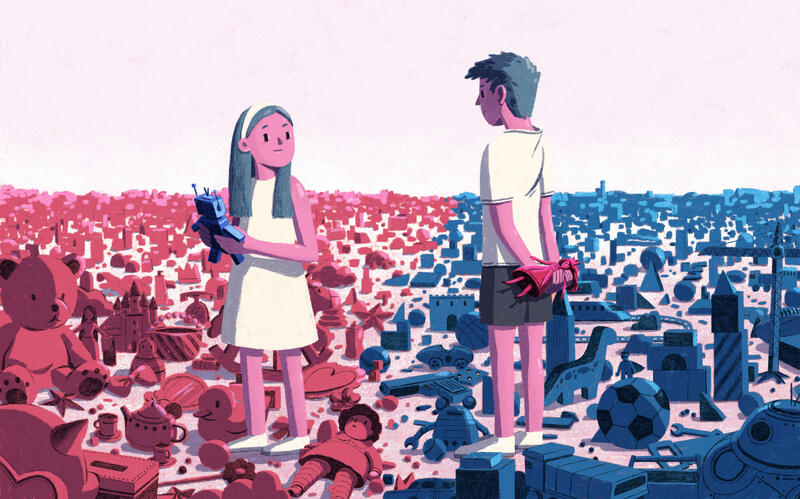 One researcher found, by looking through toy catalogs, that they are just as gendered - or even more gendered in some cases - than they were 50 years ago. MARTIN: All right. So this problem isn't getting any better with time - clearly. What are the repercussions of this? What did you find out about what this means, how it affects us and our kids? TURNER: That's what we wanted to know, too. We weren't sure where to go for answers. Luckily, though, we crossed paths with a gender studies professor at Monmouth University who studies this very question. Her name is Lisa Dinella. LISA DINELLA: I actually study superheroes and princesses. KAMENETZ: And Lisa started studying these pop culture characters because she was originally interested in how people choose careers. TURNER: But she traced the origins of those choices all the way back to early childhood and to playtime. KAMENETZ: And that's how she found that what our kids play with and how they play with it can be reflected in the people they grow up to be - for good and for not so good. TURNER: So here is an example of the not so good. So a few years back, Lisa and her colleagues surveyed women in college. DINELLA: Shockingly, we found that 33 percent of our undergraduate women in our sample said that they identified themselves as princesses. TURNER: Now, that's not inherently bad. But these princesses, they also had a few other things in common, a kind of princess mindset. KAMENETZ: They were more likely to say that they value their mate's physical attractiveness and earning power. DINELLA: They said that they were less likely to want to enter the workforce after college. DINELLA: The princesses actually quit faster than the women that said that they were not princesses. TURNER: Now, the study doesn't prove that little girls dressing up like Snow White are all going to grow up to be passive and weak. KAMENETZ: But it does hint that all this glossy pink pretty, pretty princess stuff might be kind of like a poisoned apple. ROSEMARIE TRUGLIO: It's OK for me to like pink things and pretty things and frilly things, but it shouldn't define what I will be in the future. TURNER: That's Rosemarie Truglio. She's a developmental psychologist and senior VP of education and research at Sesame Workshop. KAMENETZ: And she says it's not just toys. Books, movies, ads, apps, adults, even other kids - they're all sending powerful messages to children across the gender spectrum about who they're expected to be. TURNER: Yeah. So in another of Lisa Dinella's studies, she asked preschoolers to describe themselves and to describe what they knew about princesses. KAMENETZ: They gave the pretty typical idea of a girly girl who needs to be rescued. ADRIANA CASELOTTI: (Singing) Someday my prince will come. TURNER: But then the researchers showed the children video clips of more recent princess characters who are taking action and being more powerful. LINDA LARKIN: (As Jasmine) How dare you - standing around deciding my future? I am not a prize to be won. KELLY MACDONALD: (As Merida) I am Merida. And I'll be shooting for my own hand. TURNER: Both the preschool girls and the boys described themselves as being more multi-dimensional. DINELLA: They will say that I am strong, I am a leader. But they'll also say - I take care of people, and I share. TRUGLIO: If you could see it, you could play it. And then one day, you could be it. KAMENETZ: And that's the kind of transformation story we can all believe in. MARTIN: OK. So there are some signs that things are changing. Bottom line, though - what all parents listening to this want to know is, what's the takeaway for parents? KAMENETZ: You know, one of the main reframers for me was that, as parents, we really do have the power to help our kids expand their possibilities in play, and we should use that power. MARTIN: It actually never works (laughter). MARTIN: Cory Turner and Anya Kamenetz - they are co-hosts of the new podcast Life Kit For Parents With Sesame Workshop. You can find that podcast at npr.org/lifekit or at applepodcasts.com/lifekit. You guys, thank you so much. KAMENETZ: Thank you so much, Rachel. (SOUNDBITE OF ARMS AND SLEEPERS' "TETRO") Transcript provided by NPR, Copyright NPR.